The May/June issue of AUGIWorld has been released. 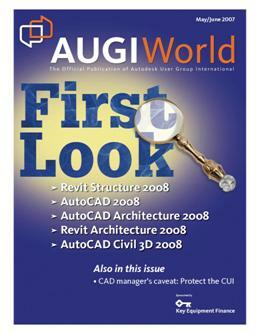 Inside this issue is a First Look at Civil 3D 2008 (pg. 22) written by yours truly. The article takes a quick look at a number of the new features within AutoCAD Civil 3D 2008, and then dives into using the new Plan Production feature. I intend to expand on articles look at Plan Production here on The CAD Geek Blog. So stay tuned. In the meantime hop over to AUGI and download the May/June issue of AUGIWorld .